I’ve decided. 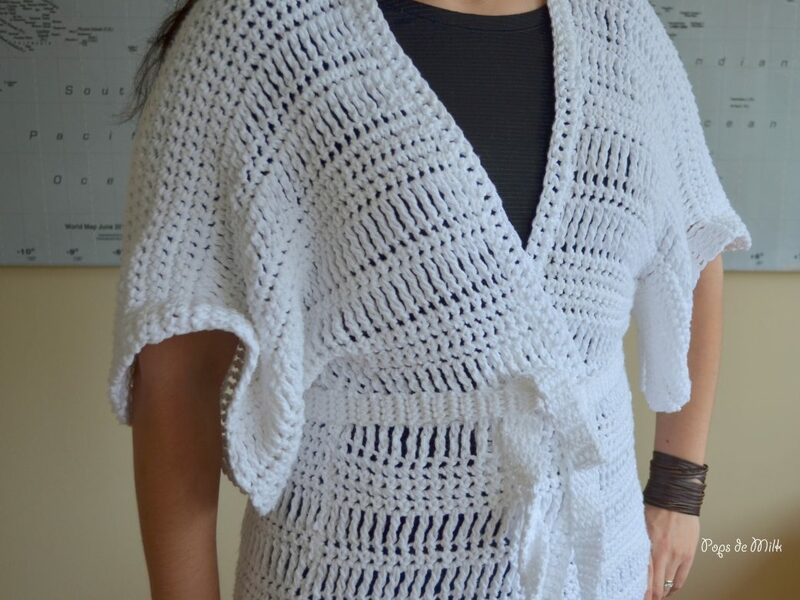 The cardigan/robe/kimono I’ve been working on is now a crochet comfy house coat. I wear it when the weather gets a little chilly or when I just want to feel cosy but not overheated. With its cotton-y softness this house coat is perfect. Like I mentioned in the first WIP post, I kind of made the pattern up as I went along and at some point I started writing instructions down and then stopped. But after quite a bit of head scratching and counting I was able to figure out what I did by just looking over the finished piece. 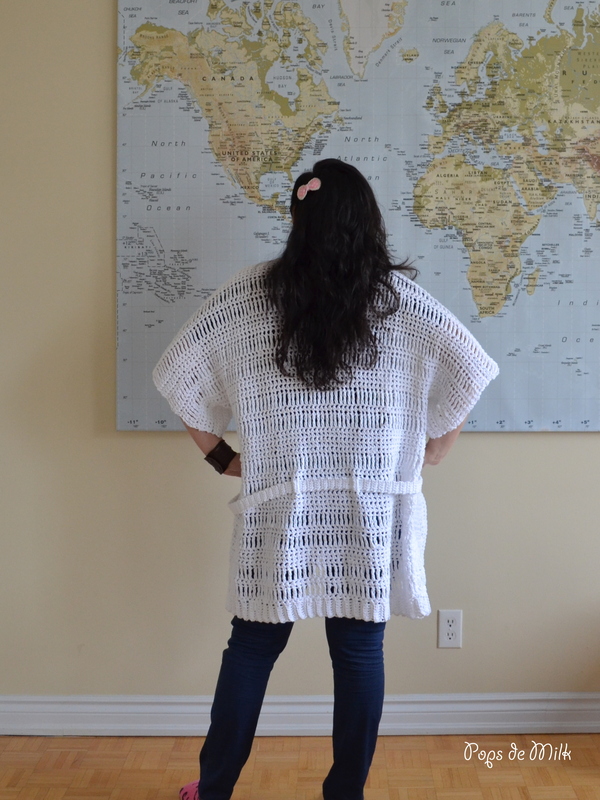 This pattern is quite simple and easy to customize to fit different sizes so stitch count is not important. The one I’ve made would fit a hip size 36″-40″ with a length of 38″ from shoulder to bottom edge. Row 1: ch 8, sc in 2nd ch from hook and across, turn. Rows 2: work in BLO ch 1, sc across, turn. Repeat Row 2 until piece measures back hip width eg. 20″ or 60 rows. Row 2: ch 4, tr in each st across, turn. Row 4: ch 4, tr in each st across, turn. Row 5-8: ch 1, sc in each st across, turn. Note: Rows 2-8 will be the repeated pattern sequence noted throughout. 1. Repeat sequence starting from Row 2 twice. 2. Repeat Rows 2-4 once. Row 1: ch 15, sc in 2nd ch from hook and each ch and st across stopping a few stitches from end of row, remove hook and pull loop so stitches don’t unravel. Insert hook in last st and ch 15, cut yarn. Insert hook back in working loop and sc in remaining sts and each ch, turn. Rows 2-4: ch 1, sc in each st across, turn. Repeat sequence starting from Row 2 of Bottom Back twice. Rows 1-3: ch 1, sc across to marker, turn. Row 4: ch 1, dec, sc across, turn. Row 5: ch 1, sc across, turn . From end of row, count 15 sts toward inside and place marker. Row 1: pick up tr in st with marker and tr in next 20 sts, turn. Row 3: ch 4, tr across, turn. Rows 4-7: ch 1, sc across, turn. Repeat Rows 2-4 of Bottom Back once. Row 25: ch 1, sc across. Pick up sc in right neck marker and follow the same method as the Left Front Sleeve and Left Front. Row 2-21: work in BLO, ch 1, sc across, turn. Fasten off and leave long tail for sewing. Evenly sew ribbing to each bottom front. Row 1: Starting with Front Right Bottom, pick up sc in first st from ribbing, sc in each stitch and continue to evenly sc along the side rows all the way around until the Front Left Bottom, turn. Flatten sleeves and align, place marker in top neck/shoulder corner and do the same on the other side. Row 2: ch 2, dc in each st across until first marker, sc in each st until second marker, dc in remaining sts. Row 1: ch 5, sc in 2nd ch from hook and across, turn. Thread through tr sts of chosen row. I love it. I might make one my own.